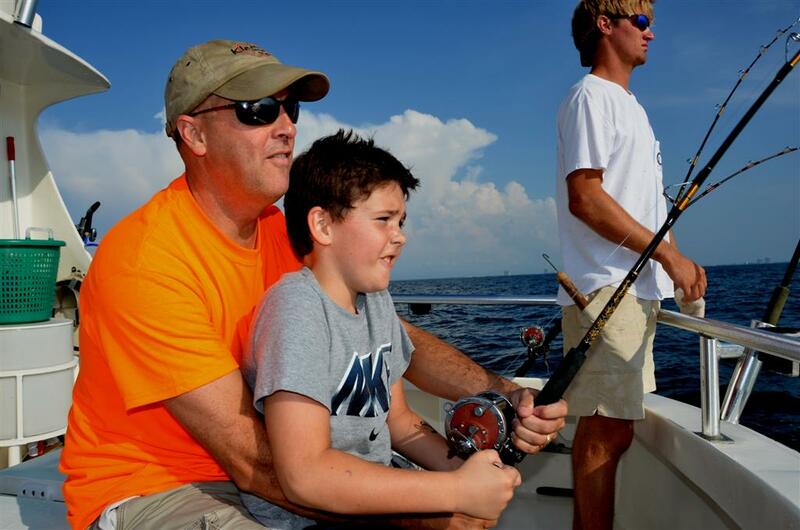 One of the most common types of fishing trips in Orange Beach, Alabama, is called trolling. 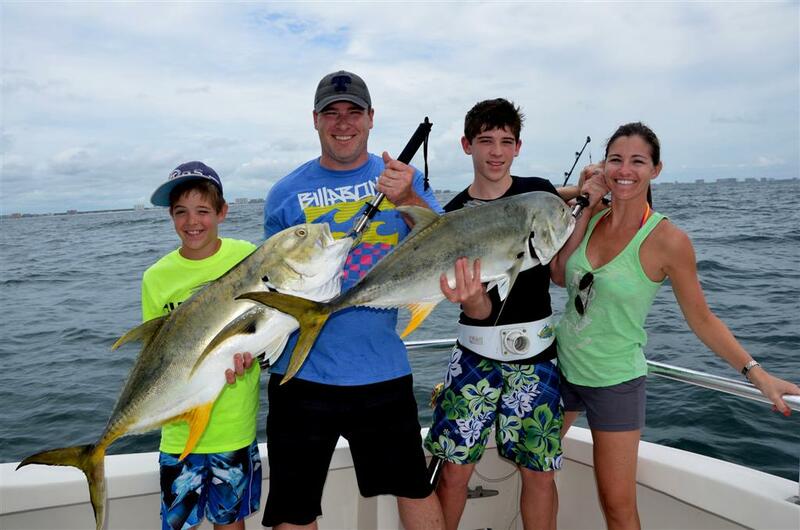 We combine trolling with our deep sea fishing trips so you get to experience so much more out of your fishing trip. High speed and slow speed trolling fishing is a major part of our half day and full day trips. On the way offshore to the artificial reefs, we keep the charter boat moving, dragging baits of different sizes and colors at different distances and depths behind the boat, trying to catch different varieties of pelagic fish like mackerel, bonito, dolphin fish, jack crevalle, wahoo, etc. On these trips, the poles are placed in rod holders on the edge of the boat and when a fish strikes, someone grabs the pole and fights their fish all the way to the boat. Depending on the species, its size and if it’s in season or not, you may decide to keep it or may have to release it. 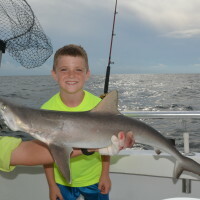 Trolling is very popular among families who are not sure about going deep sea fishing way offshore or are concerned about how their kids or family members will do on their first trip. This style of fishing can be very productive during the summer and fall months of the year. For those of you who don’t know what to expect when trying to decide between a four hour trip or our most popular half day trip, let us help you. Trolling can either be boring or red hot while you are offshore fishing. When the bite is hot, this style of fishing is a lot of fun. When the bite is slow, these trips are like watching paint dry. That’s why we combine them with bottom fishing trips so you will have a chance to have something tugging on your line. One thing for sure, when a fish strikes your bait and the reel starts screaming, your adrenaline will surely start pumping. Trolling is where we keep the boat moving, dragging lines behind the boat – waiting for the fish to strike. What is near shore trolling fishing? Trolling is a style of fishing that is used the world over to catch many varieties of game fish and pelagic fish as well as near shore fish. 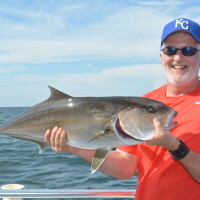 There are some basic techniques that we use here in Orange Beach that are extremely productive but only a few of us seasoned veterans know really what to look for and do in different sea and weather conditions. We call it patterning the fish. That is why fishing with a professional offshore fishing guide saves you time, saves you money and often gets you the results you desire or what we call, a return on your investment. Sure, sometimes the fish don’t always cooperate, but you certainly increase your chances of catching fish when you choose a charter boat that fishes full time for their living. Since there are many different species, you never know which type is going to strike your line. 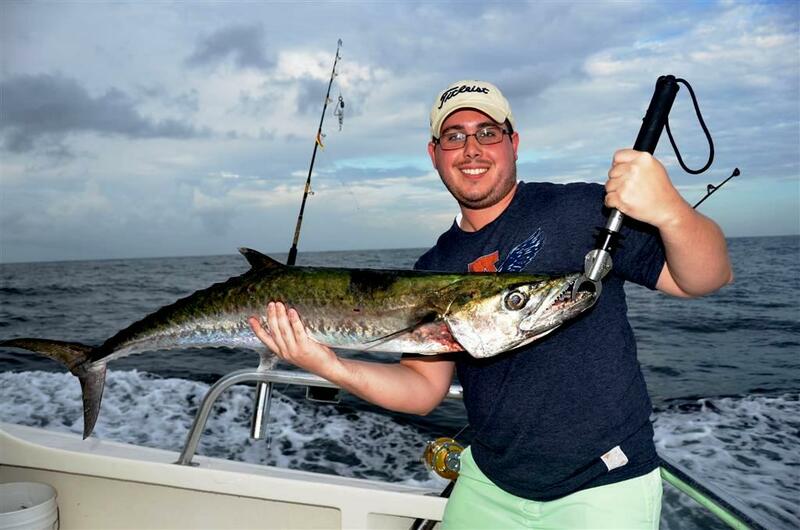 Common fish caught while near shore trolling are: King Mackerel, Spanish Mackerel, Ladyfish, Bluefish, Jack Crevalle, Bonito and occasional but rare mahi mahi, Blackfin Tuna or Wahoo. 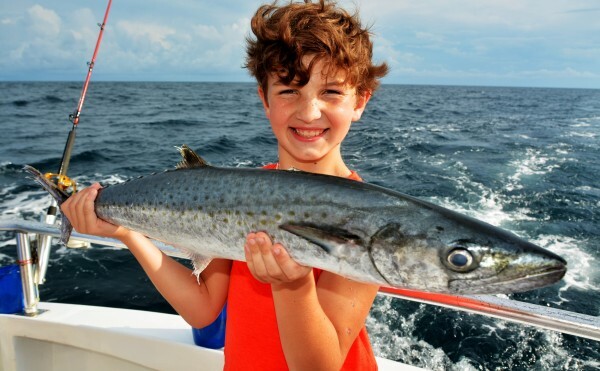 King Mackerel are caught from May to December while trolling fishing off Orange Beach. 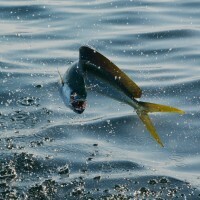 Trolling techniques include, keeping the boat moving forward as you place lures and baits out behind the boat at different distances and depths and pull them. 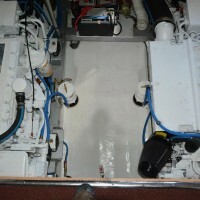 On larger boats with a lot of rail space, we can put as many as five lines out at one time. On some occasions, we put the outriggers down and use a clothes line technique to spread our baits further apart, much like a farmers plow does with wings. Outriggers simply allow us to make baits look more natural while being pulled. Most of the time it is not necessary to use outriggers, but they are an important tool when fishing for Marlin, Tuna and Mahi Mahi. Most of the time we pull the baits and lures from 5 knots up to close to 8 knots. I have been fishing for years and find 5 to 5.5 knots to be the most productive. On days when the water is clear, faster speeds are more productive. 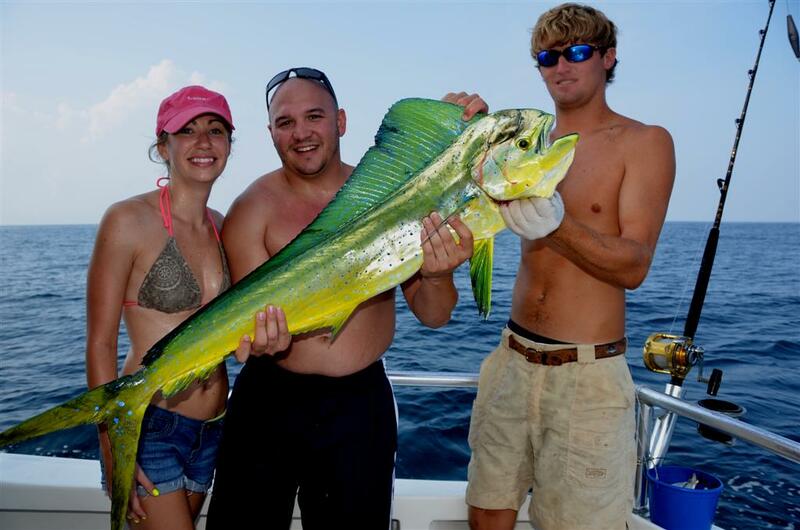 During the warmer months, big game fish like Mahi Mahi are caught trolling near shore. 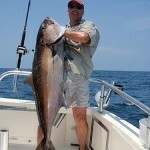 Near Shore fishing charters keep you near the shore and are usually 6 hours in length. The depth of the water near the shore is from 15 feet up to 40 feet. Sometimes, we have to head further offshore to waters that are 75 feet deep in order to find fish that might be deeper during the hottest part of the day. Where we go depends on where the fish are. Most of the time, we stay near the shore. Depending on the time of year, the fishing season and the sea conditions, we try to catch you fish in these areas. This is when we keep the boat moving at about 5 to 6 knots while dragging lines with lures or baits behind the boat. We put a wide variety of artificial and natural baits out at different distances and depths trying to catch your family some fish. However, there are times of the year when we combine trolling fishing with sight fishing. A big Jack Crevalle fights harder than any fish you will ever catch.